Access keys are ALT key shortcuts that allow you to activate a control, or give focus to a control. For controls that have captions, like buttons and checkboxes, the access key is the character in the caption that is underlined when you press the ALT key. For controls that do not have a caption, a user interface will typically include a label near the control that does have an access key. 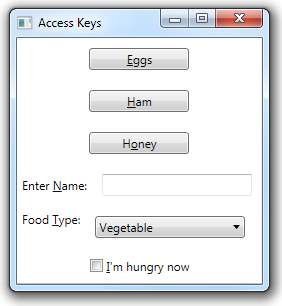 Activating the access key of that label will typically give focus to the nearby control. 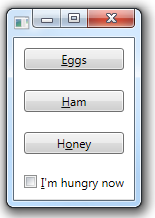 In the example below, the TextBox and ComboBox controls do not have access keys of their own. But both have an associated label with an access key. Activating the access key of one of these labels will give focus to their associated control.